Michelle, Florida native, Broker Associate and GRADUATE of the REALTOR INSTITUTE has extensive knowledge in the area of marketing and selling luxury products. Michelle’s success is largely attributed to her home-grown knowledge and passion for waterfront living, particularly on the Barrier Island where she and her family have spent many years living, working and playing in the blue Atlantic ocean and the Indian River Lagoon. 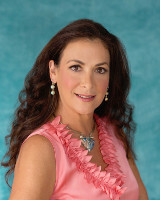 Michelle, internationally recognized as a coastal Florida expert, has been featured in media and publications worldwide. She's a member of Who's Who in Luxury Real Estate and is affiliated with the most impressive names in Real Estate today: Leading Real Estate Companies of the World & Luxury Portfolio International. In addition to several key locations along the Treasure Coast of Florida to serve your local Real Estate needs, Michelle has unique ability, resources and connections to assist you with estate sales and purchases around the globe. Allow her to demonstrate her skills and her Art of Introduction tapping into her vast network of international friends, associates and clients notwithstanding the firm's UK office located in Mayfair! Michelle is a genuine Florida native and L I V E S the Florida lifestyle! Her multi-lingual communication skills combined with business acumen as well as luxury branding/marketing expertise always delivers no matter whether you are in search of a seasoned listing agent or lifestyle specialist for the purchase of your next treasured home. Michelle's clients often become repeat customers. Her attention to details, stellar customer service and the personal respect she demonstrates will save you time and resources, negotiating the greatest value for you in each and every transaction.